The module provides basic markup for each of the elements but you will likely need to provide your own styles. Replace the $Content variable with $ElementalArea in your page templates, and rely on the markup of the individual elements. For a more detailed overview of using this module, please see the User help guides. For a SilverStripe 4.1 or 4.2 compatible version of this module, please see the 2.x or 3.x release line. For a SilverStripe 3.x compatible version of this module, please see the 1 branch, or 1.x release line. The following YAML config will enable elements on every Page object, replacing the standard Content rich text field. In your page type layout template use $ElementalArea to render the elements to the page (in place of $Content). 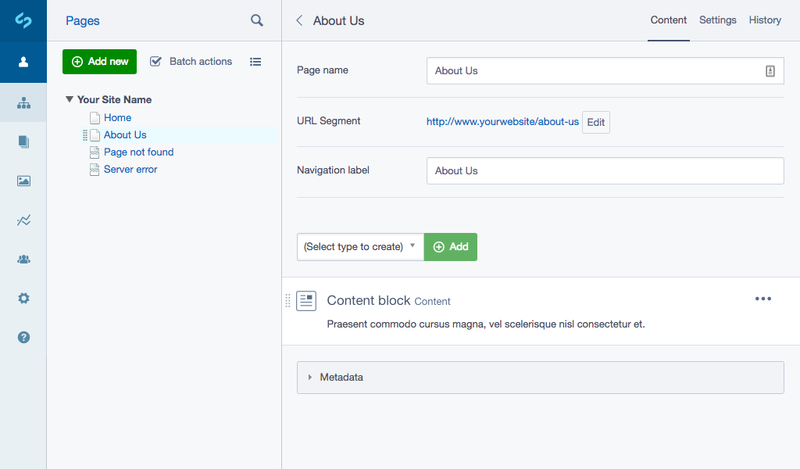 To learn more about SilverStripe supported content block types see, Creating new blocks. If you want to use elements alongside traditional page types, you can define an "empty" page type and assign the extension only to this type. The basic element area is rendered into the DNADesign/Elemental/Models/ElementalArea.ss template. This loops over each of the element controller instances. Each controller instance will render $ElementHolder which represents the element contained within a holder div. The wrapper div is the ElementHolder.ss template. To customise the ElementEditor in the CMS you will need to use the SilverStripe JS Injector to apply transformations to the necessary React components. See here for more information. Likewise, you can exclude certain elements from being used. By default the page to element relationship is a "has one", meaning you cannot share elements between pages. If this functionality is desired, you could take a look at the silverstripe-elemental-virtual module which helps to achieve this. An element is as simple as a PHP class which extends DNADesign\Elemental\Models\BaseElement, and a template to go with it (unless you want it to use the default template). After you add the class, ensure you have rebuilt your database and reload the CMS. Elements can be edited in the CMS using an inline form where all your elements appear together. For elements that are more complex (e.g. use custom FormField classes) you can disable the in-line edit form by setting private static $inline_editable = false in your element class. A GridFieldDetailForm will be used to edit blocks that are not in-line editable. Alternatively as the CMS element editor is now React driven, in-line editing functionality can be added to by defining your own React components. Note: The default is that all elements are in-line editable. If in-line editing is not disabled, whilst not having a custom component defined, custom fields will not be rendered unless the field's schemaDataType is set See Framework's FormField definition. After building your own React components and including them into the CMS, altering the applicable Element's PHP definition to use the new React component can be achieved by setting some protected properties of that class. The $schemaDataType does not need to be CUSTOM, but should not be STRUCTURAL as structural types are not submitted as form data. The $schemaComponent is the name of the React component you have created to be used. MyElement will be rendered into a MyElement.ss template with the ElementHolder.ss wrapper. Changing the holder template can be done via YAML, or by using a $controller_template on your subclass. To customise existing block templates such as Content and Form templates, copy the relevant files from vendor/dnadesign/silverstripe-elemental/templates to your theme. When doing this, ensure you match the folder structure (PHP class namespace) to ensure that your new template version takes priority. Note: The default set of elements follow the [BEM (Block Element Modifier])(http://getbem.com/) class naming convention, which allows developers to style individual parts of the DOM without unnecessarily nested CSS. Where possible, we encourage you to follow this naming system. Via YAML you can configure a whitelist of style variants for each BaseElement subclass. For instance, if you have dark and light variations of your content block you would enter the following in YAML in the format (class: 'Description'). The class will be added to the ElementHolder. When installing this module, there may be a default set of CSS stylesheets that come to provide some examples for the various default element types for the front-end website. The Elemental module comes with an indexer for Solr (via the silverstripe-fulltextsearch module). You can enable this index in your search engine to ensure that a page's elemental area content is indexed under the page's data. For information on configuring Solr please see the fulltextsearch documentation. Note: If using this indexer, be aware that HTML tags will be stripped from the content before it is indexed. The Solr search results may add in emphasis tags or other formatting around matched key words, so you may need to allow unescaped HTML in your search results template. You should use the $Excerpt property (see SolrIndex::search for more) to display the relevant search matches. You'll need to have yarn installed globally in your command line. Note: If adding or modifying colours, spacing, font sizes etc. please try and use an appropriate variable from the silverstripe/admin module if available. For developers upgrading from Elemental 3 to 4, see the upgrade guide. CMS Icon blocks by Creative Stall from the Noun Project.